We are part of our local community. We live, work, and play alongside the people we serve. We work hard to keep our local communities healthy, safe and economically vibrant. Join us each August at the Grant County Fairgrounds for the Grant County Fair. 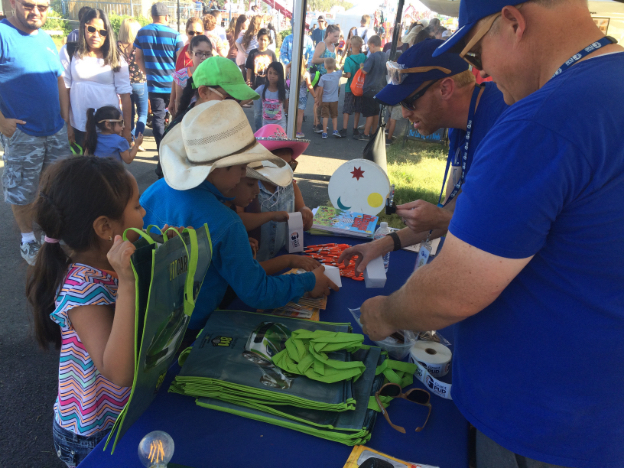 In addition to fun giveaway items found at our booth visitors can also explore the culture of the Wanapum at their traveling exhibit. Also every evening Grant PUD’s line crew provides their electrical safety demonstration. 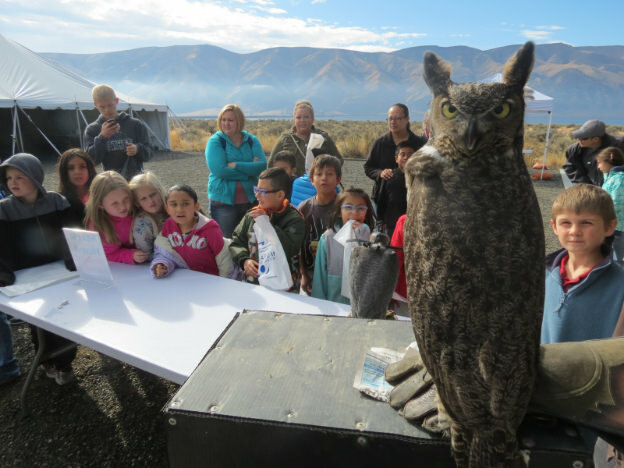 In October schools from around Grant County visit the Wanapum Heritage Center for Archeology Days Archaeology Days provide a fun and interactive experience for all to learn more about the Wanapum way of life. Enjoy expert speakers on a host of cultural, historical and natural topics. Enjoy hands-on activities and events. For more information, visit Wanapum.org. We believe it is vital to educate future generations of leaders in Grant County about the topics of electrical and water safety, the system that generates and delivers electricity, and how to be good stewards of the environment we share with fish and wildlife. That’s why we participate in several educational programs and activities for children of all ages so they can have a better understanding of Grant PUD’s role in their world and how the choices they make can have a lasting impact on not only them but generations to come. 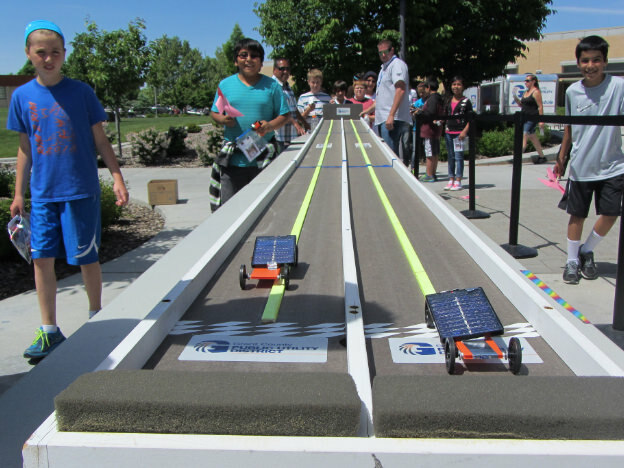 Each spring, fifth graders around Grant County visit Big Bend Community College for Solar Races and Energy Science Days. The event, which is presented in partnership with several area businesses and organizations, focuses on renewable energy sources including hydropower, solar and wind energy. Students enjoy hands-on experiences with one of the highlights including them being able to race solar powered cars they build. Throughout the summer, Grant PUD visits local libraries throughout the county as part of the North Central Regional Library’s Summer Reading Program. 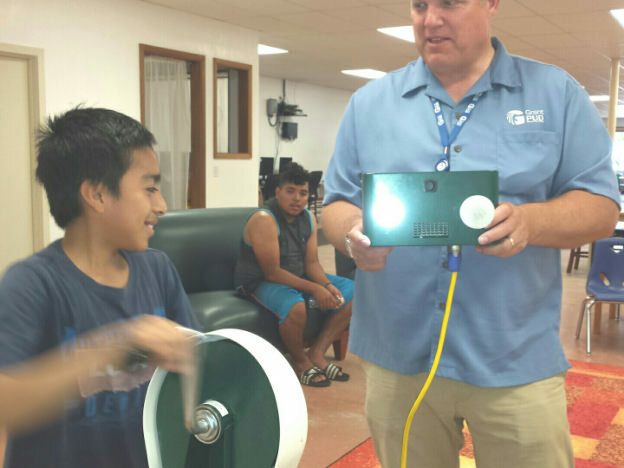 The program shows how the naturally-occurring water cycle allows power companies like Grant PUD to generate electricity while also teaching about how power is delivered to customers throughout Grant County. 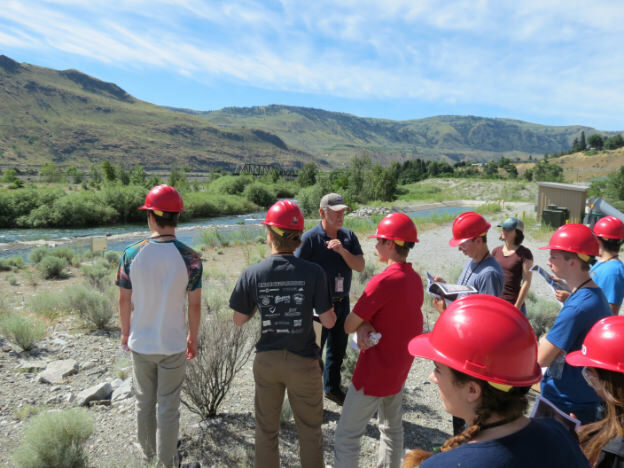 Grant PUD is proud to be a partner with the Foundation for Water & Energy Education (FWEE) on their Hydropower and Stem Career Academy. The Foundation provides a weeklong career exploration opportunity for high school students. During the academy, students learn from industry leaders and discover hydro industry careers all while earning college credit. 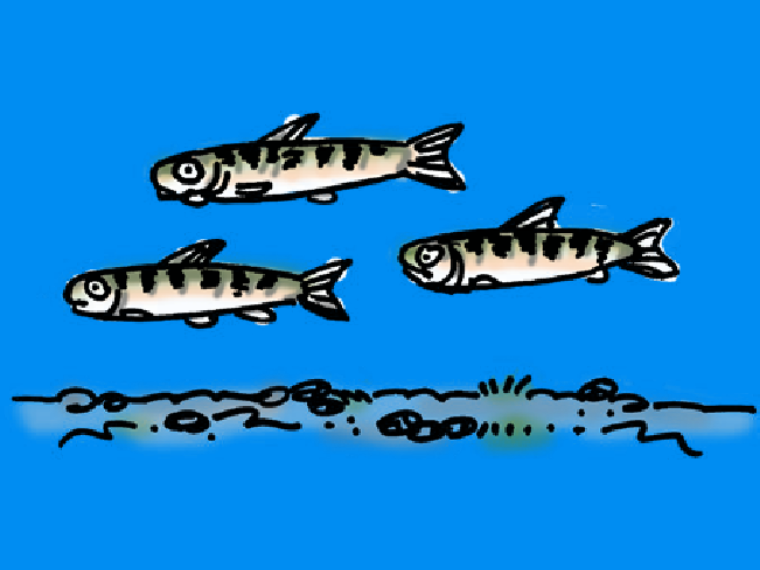 Follow the lifecycle of a Chinook salmon as it makes its way to the ocean and back. The Columbia River is legendary for producing salmon. Salmon are called “anadromous fish,” because they migrate from fresh water to the ocean where they mature and then return to fresh water to spawn the next generation. Learn what Grant PUD is doing to help salmon as they journey to the ocean as young fry and return as mature adults to spawn the next generation of salmon. 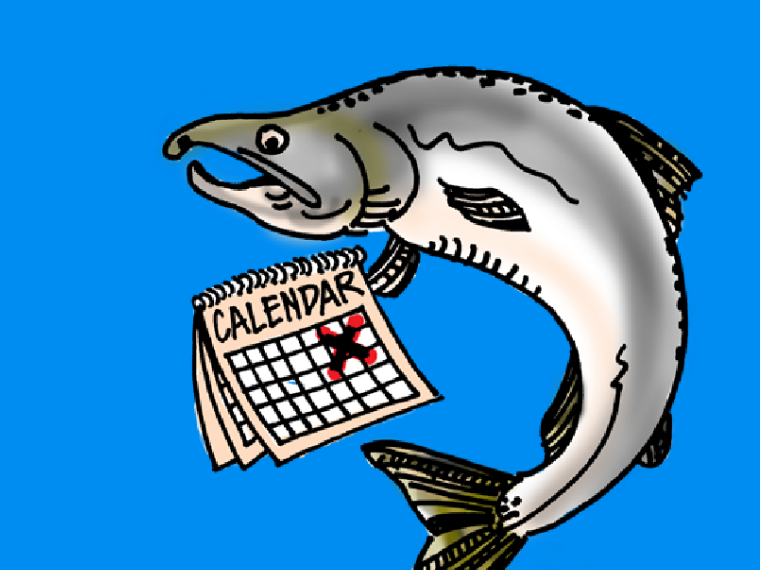 Spawning takes place in late summer and fall each year. A female Fall Chinook salmon lays up to 4,500 eggs in a gravel nest called a redd. 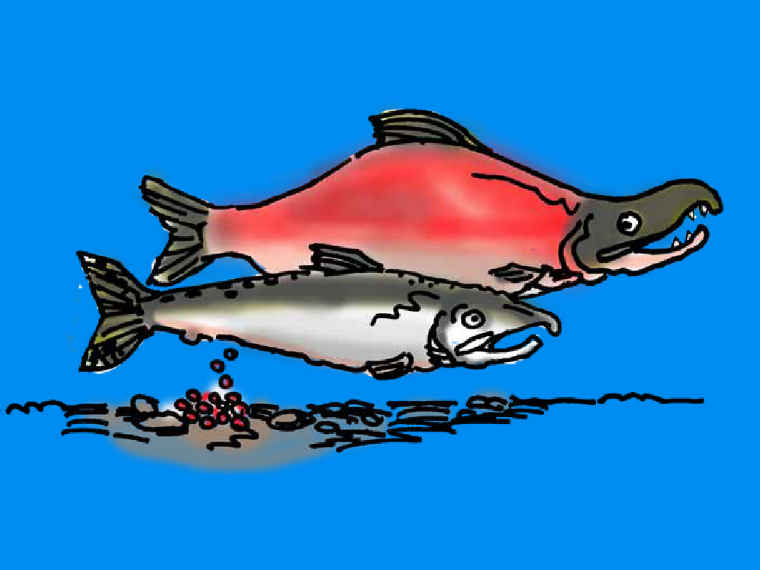 After the dad salmon fertilizes the eggs, the mom covers the redd with gravel. The egg hatches into a tiny larvae called an alevin. The alevin has a large, orange yolk sac below it belly which contains a balanced diet of protein, sugars, vitamins and minerals. Kind of like a bowl of cereal they carry with them. 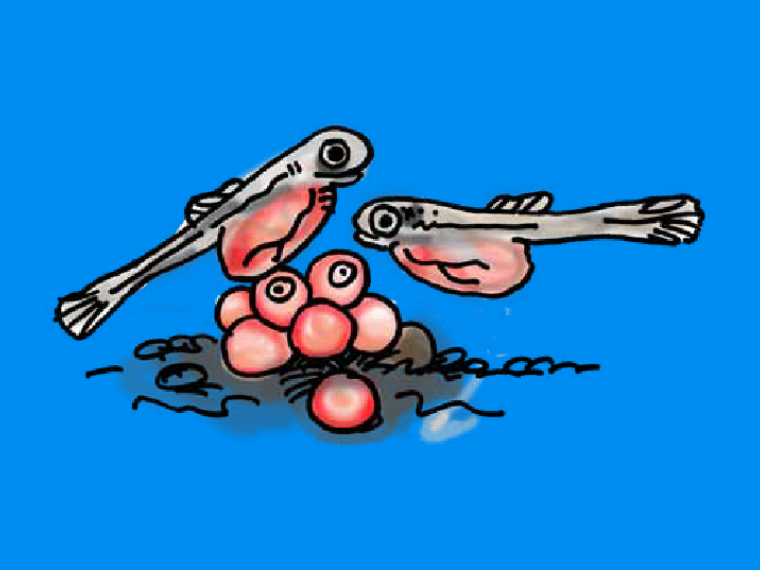 The yolk sac gets eaten while the alevin changes to a tiny fish called a fry, less than an inch long. The fry then begins to look for food on its own. In about four months, the fry will have grown to about the length of an adult human’s finger, and they are called fingerlings. They begin to swim downstream to the ocean. The young salmon’s journey to the ocean is full of obstacles. Only about 3 in 1,000 survive the journey. Ducks, herons, kingfishers, other birds and wildlife eat young salmon. Other fish like northern pikeminnow like to live in the waters surrounding the hydroelectric dams and feed on the small salmon as well. The smart, young salmon travel at night to avoid these natural predators. The fish must also navigate their way past hydroelectric projects on the Columbia River. As the baby Chinook salmon moves downstream, it imprints the smells of the stream where it hatched as well as different water bodies on its journey to the ocean. This homing skill will guide the fall Chinook salmon back home after it spends two to five years growing in the ocean. 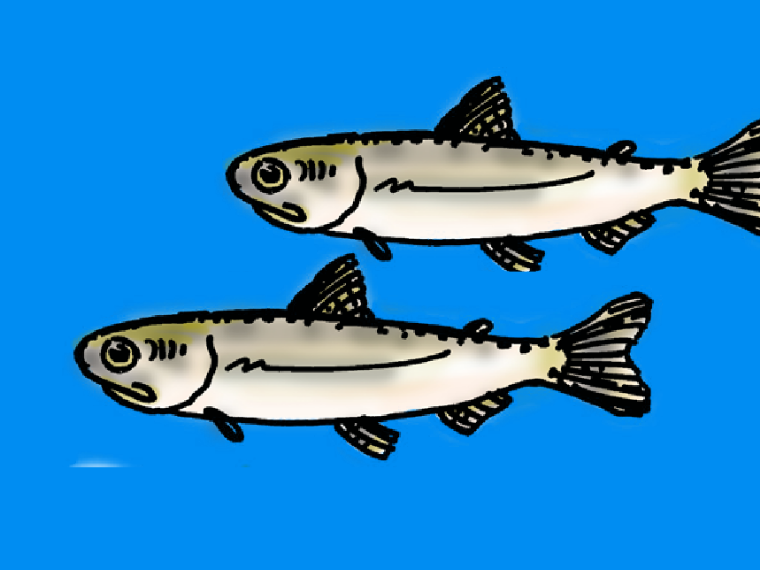 As the fingerling gets closer to the ocean’s salt water, it makes significant physiological changes to become a smolt. 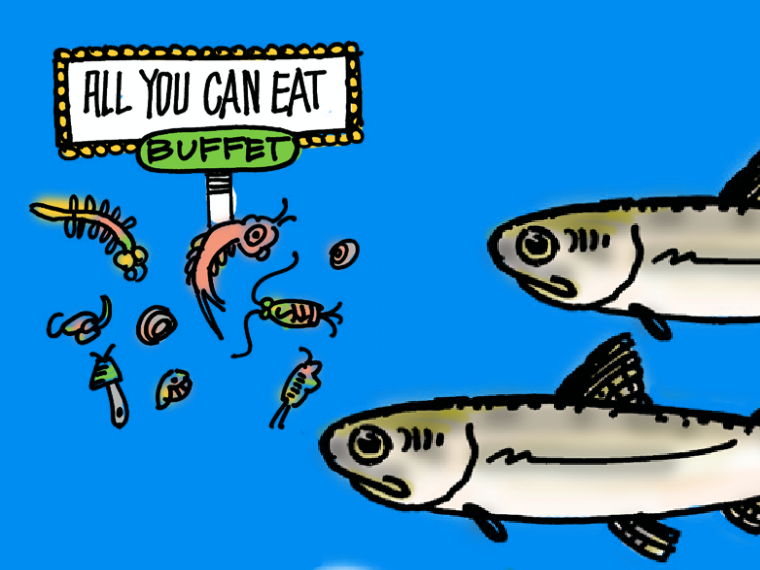 Once they reach the Pacific Ocean, young salmon feed on zoo-plankton, shrimp, crustaceans, anchovies and herring, as well as other fish. In two to five years, fall Chinook salmon can grow to weight over 20 pounds. Every salmon has its own time to return to the fresh water and its birth stream to spawn. 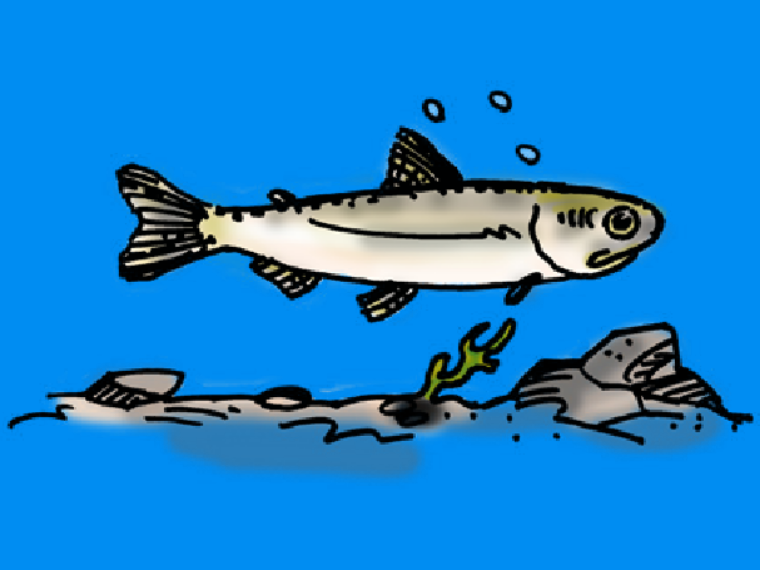 Once that cycle is complete, the male and female salmon die. Their bodies decay in the streams and provide food for all kinds of other animals. That’s the cycle of life. To learn more about what Grant PUD is doing to protect fish, wildlife and cultural resources, visit our fish and wildlife page. Hydroelectricity is generated by the force of falling water. The Columbia River moves through our dams and spins turbine blades below the water’s surface. Grant PUD has the capacity to generate more than 2,100 megawatts of clean, renewable hydropower. Falling water spins the turbine blades below the water’s surface. 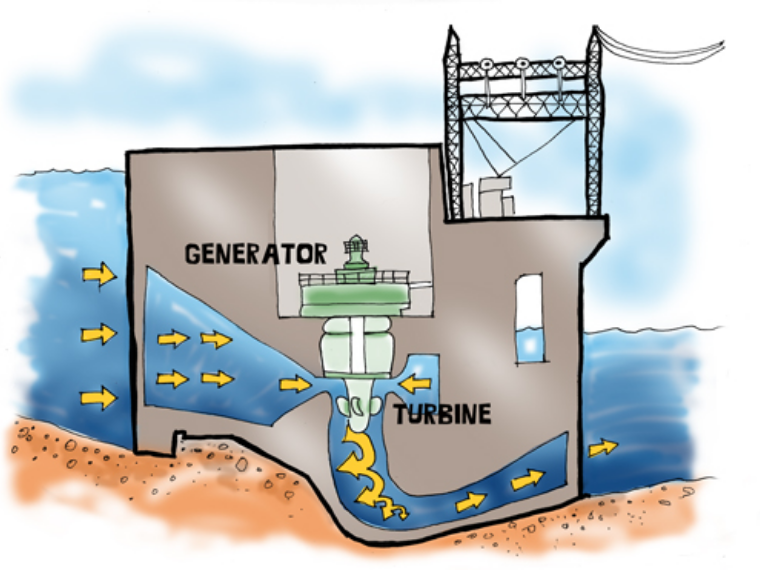 A shaft attached to the turbine rotates inside a generator. The generator has an electromagnet that moves around a ring of copper, sending electrons at the speed of light on wires to power homes, businesses and factories. Using hydropower avoids nearly 200 million metric tons of carbon pollution in the U.S. each year. That’s equal to the output of over 38 million passenger cars. 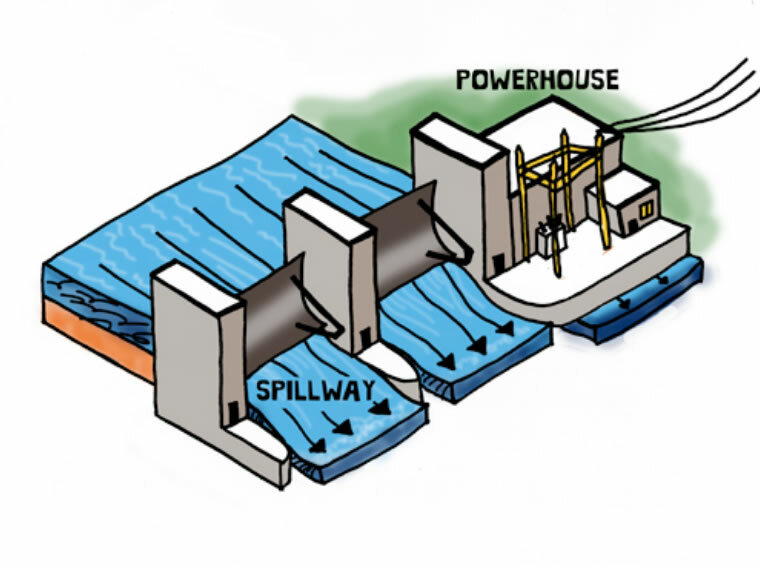 Power generated by the turbine inside the dam travels to a transformer that “steps up” or increases the voltage for efficient transport over transmission lines. 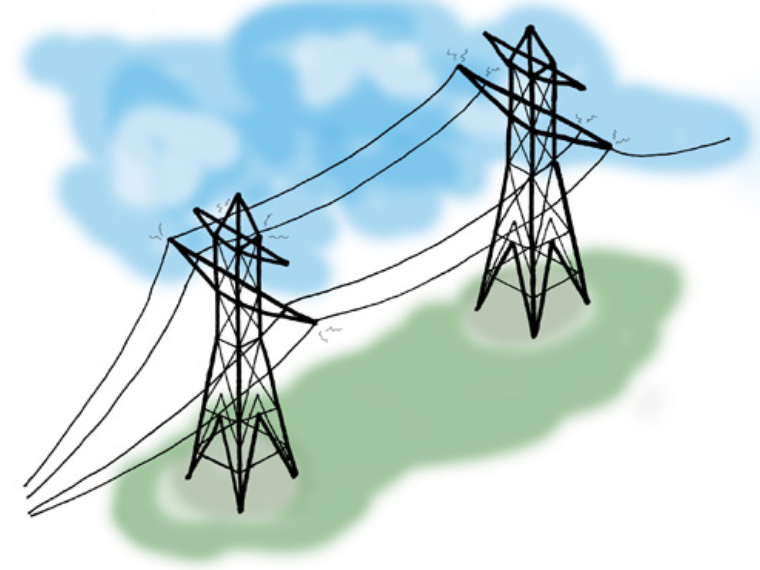 Transmission lines carry electricity over long distances. Grant PUD maintains 474 miles of high voltage transmission lines throughout our 2,777 square-mile service territory. 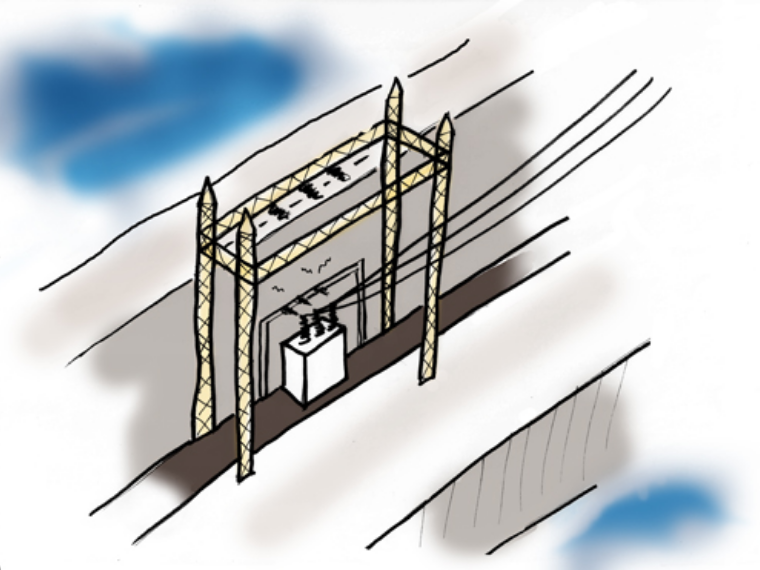 From the transmission tower, the electricity goes to a transformer at a substation near your house. The transformer “steps down” or decreases the voltage for distribution. 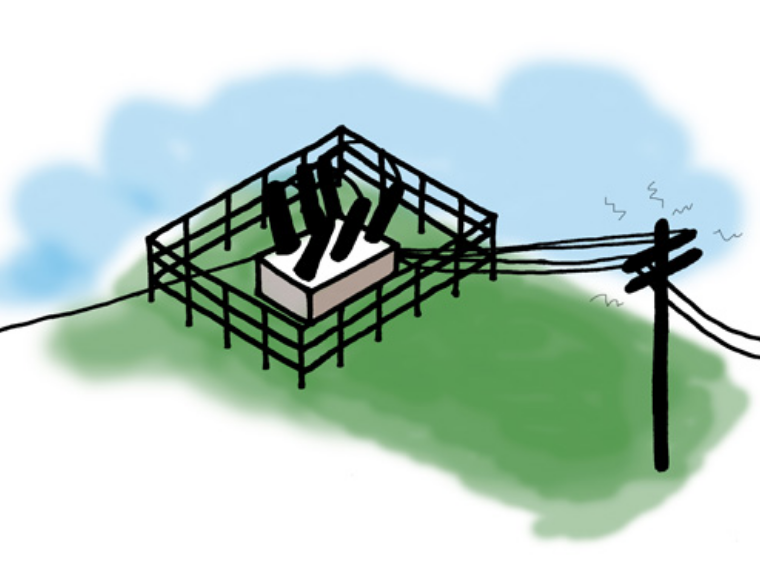 Over 55 substations transform from high to low (or vice versa) in Grant County. 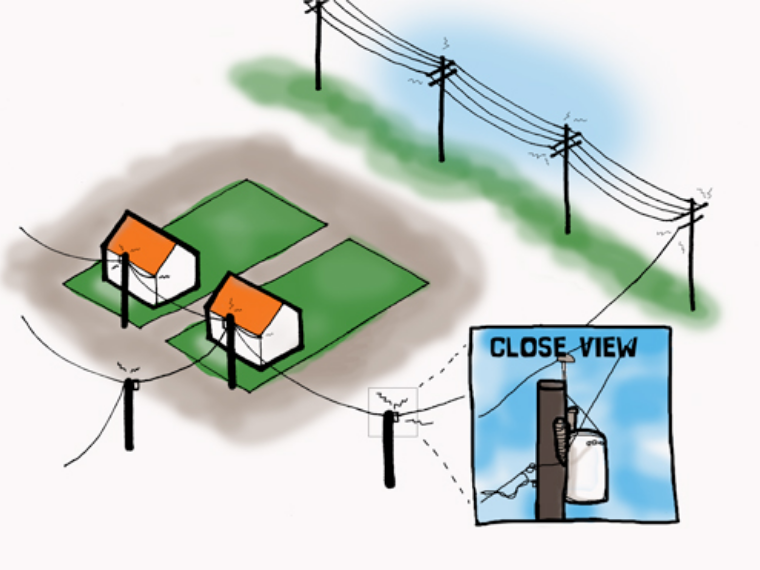 Distribution lines carry electricity from the local substation to your home. Transformers on power poles decrease the voltage before it enters your house. We deliver energy to local homes, businesses and farms through 2,781 miles of overhead distribution line and 1,073 miles of underground distribution line. Grant PUD delivers power to more than 40,000 customers throughout the county. Visit our energy page to learn more about power generation, delivery, and programs.